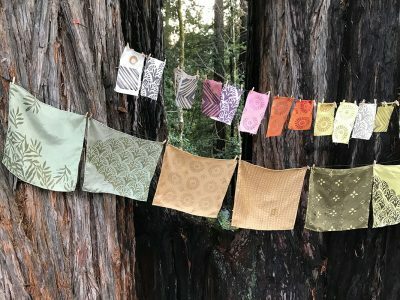 Expand your natural dyeing skills into a whole new realm with this 2-day exploration of block printing and surface design! 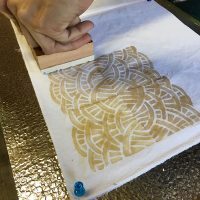 In this workshop we will explore the possibilities and practice of block printing on textiles to create rich, wash-fast and light-fast designs using natural color. 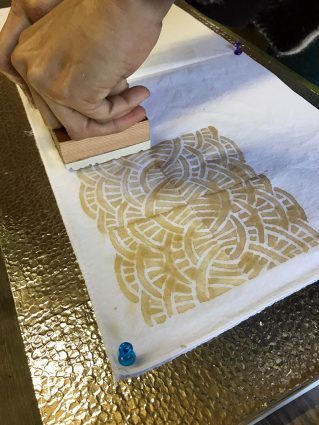 Students will first be guided through the process of designing and carving their own personalized blocks for printing, and then multiple printing techniques and mediums will be explored… printing with mordants, resists, and discharge mediums will be covered, as well as tips for selecting materials and setting oneself up for success. 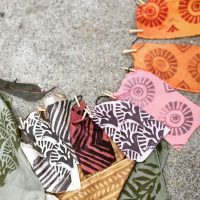 On the second day there will be ample opportunity to dye our printed fabrics and play with a variety of natural dye vats. Students will go home with their block carvings as well as multiple finished fabrics and samples that they have printed and dyed using their designs! Kori Hargreaves holds degrees in both studio arts and plant biology from UC Davis, and owns and operates Dawn Creek Farm in Rio Linda, CA with her husband, where they grow specialty cut flowers, veggies, and dye plants for their community. 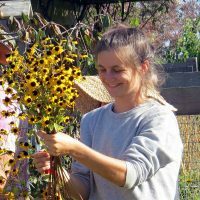 She has spent the last decade immersed in exploring painting, natural dyes, weaving, and textile & clothing design, and founded Ecotone Threads, a company whose mission centers around the sharing of knowledge and the intersection of textile arts, science, and the natural world. Read her full bio here.